A recent purchase on EBAY. It is unused, so the date cannot be known. 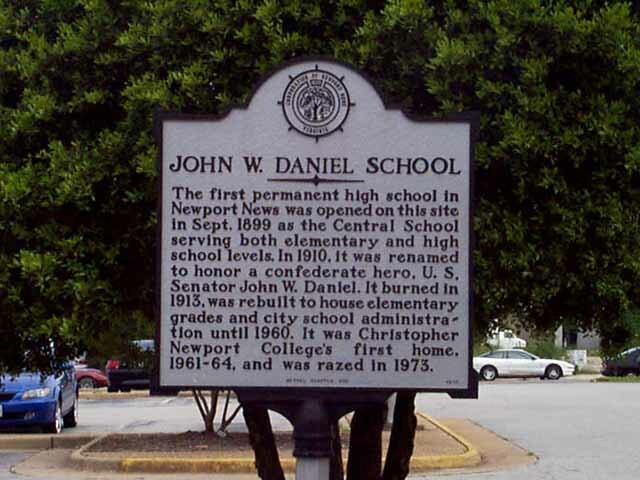 However, the caption "New John Daniel High School" dates it after 1910 (when the school was renamed Daniel School) and prior to the construction of NNHS. Note the shadows cast by the trees. We will assume that these were not added by the publishers. The shadows place the sun behind the camera, which means that we must be looking north. Thus, we are looking across 31st Street. The Good Old Days in Hampton and Newport News, Parke Rouse, Jr., The Dietz Press, Richmond VA., 1986. I want to tell you how appreciative I am on what you do on this site! 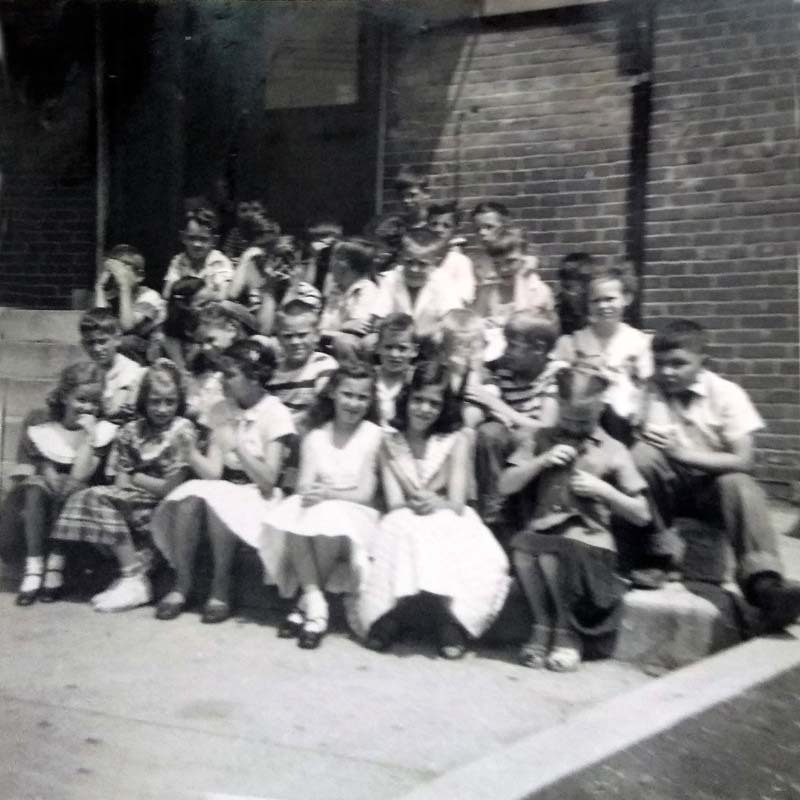 I sent you a request 13 years ago with picture of friends I had when I attended John W. Daniel School from 1950-1953 (1st through 3rd grades). In April 2018 I saw a private message in Facebook from Julia’s son who saw my post on your John W. Daniel School page. He said he was pretty sure his mother was one of my friends! And she is! Her name is Julia McDonald Robinette and she said she graduated from Newport News High School in 1962. 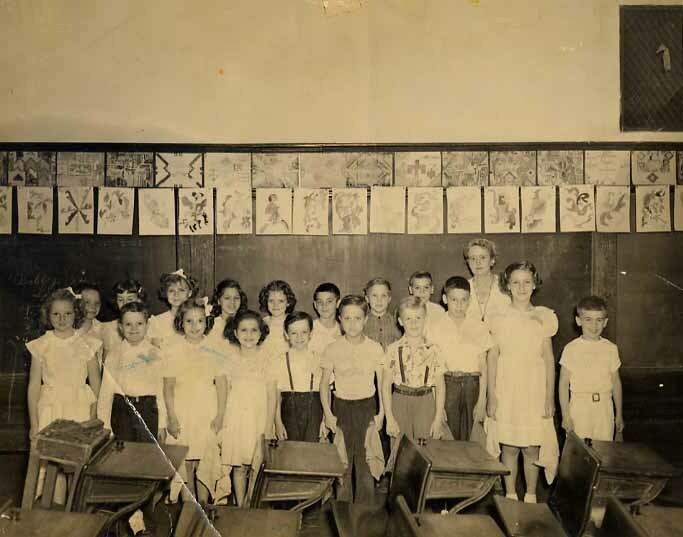 We have corresponded and she sent me the attached photo which had to be Mrs. Savin’s 3rd grade class. 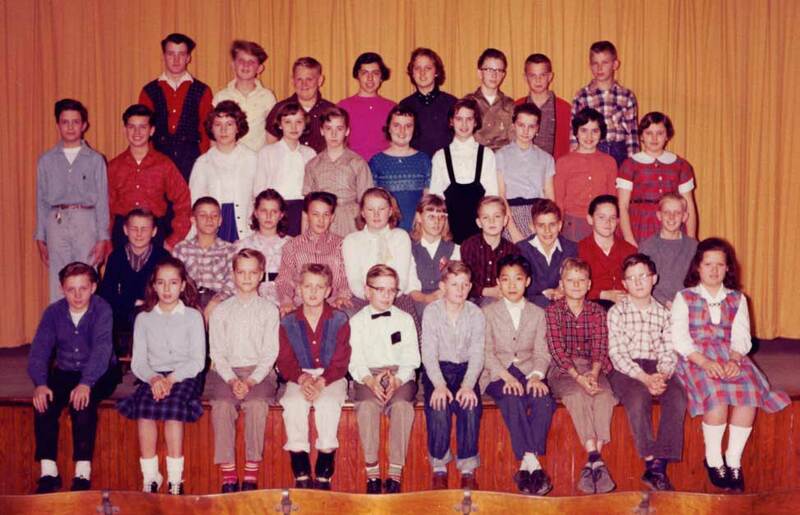 I am second on right on front row and my friend Betty Smith Carey is sitting to the left of me (looking at the picture). Our friend Joan (whom we have not located yet) is sitting on the end of the front row. The picture is hazy and I cannot pick Julia out – and she said she couldn’t either. Betty and I corresponded until she passed away on August 31, 2009. She graduated from Warwick High School. BACK ROW: __?__, __?__, James Lovedahl, James Roland, Richard Lovelace, _?_, _?_. BACK ROW: Raymond Staton, _____ _____, Tony Benton, _____ _____, _____ _____, Chris Kypriandes, Paul Neal, Tommy Gilbert, and _____ _____. BACK ROW: Chris Kypriandes, _____ _____, Tommy Albert, _____ _____, _____ _____, Raymond Staton, and Tony Benton. The last class to graduate John W. Daniel Elementary. 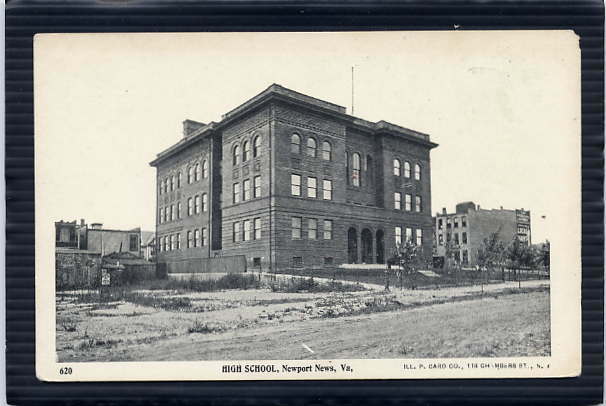 After the school closed the building was used for the newly established Christopher Newport College. THIRD ROW: Tommy Brown, Butch Braswell, Deloris Jackson, Lucy Turlington, Judy Phillips, Terri McAfee, Brenda Campbell, Mozelle Smith, Wanda Crump, Dee Hodges. 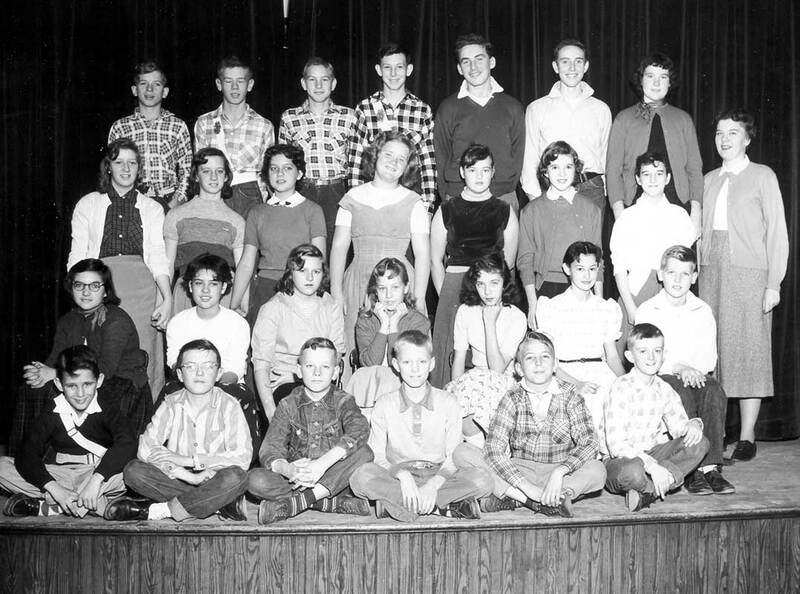 SECOND ROW: Daniel Hartzler, Raymond Price, Patty Edmondson, Kenny Thomas, Nellie Hudgins, Peggy Burton, Chuck Jones, Butch Kypriandes, Tim Rogers, Bobby Houston. BOTTOM ROW: Butch Pettiway, Shirley Kennedy, Don Kirkland, Lewis Lockhart, Larry Campbell, Tony Hall, William Leong, Ricky Montague Jimmy Mingee, Mae Mitchell. Both Photos Courtesy of Arnie Mull ('64) of VA via Richie Allen ('66) of VA via Sandi Bateman Chestnut ('65) of VA - 03/27/03 - or do I have that backwards?!? place on the playground every year. Lots and lots of memories come alive upon seeing the photo of John W. Daniel. Teachers - Ms. Rogers, Ms. Martin, Ms. Wilson, and Ms. Moore reappear in my memory. Thank you so very much for your Newsletter. 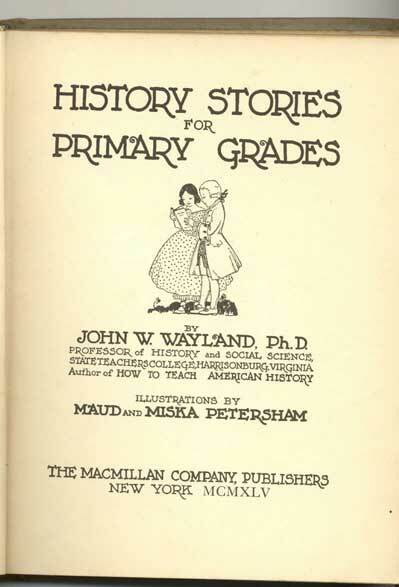 a part of the curriculum while I attended John W. Thought it might be of interest to share with some of us "oldies, but goodies". 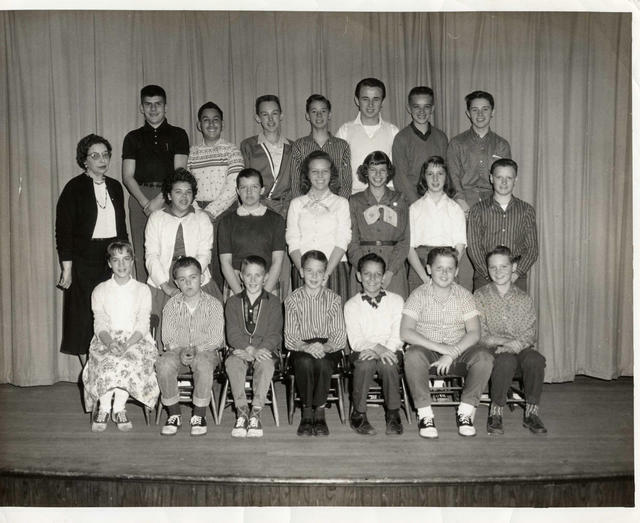 We have never met...my cousin who is a 1963 NNHS graduate told me about this site and I LOVE it! 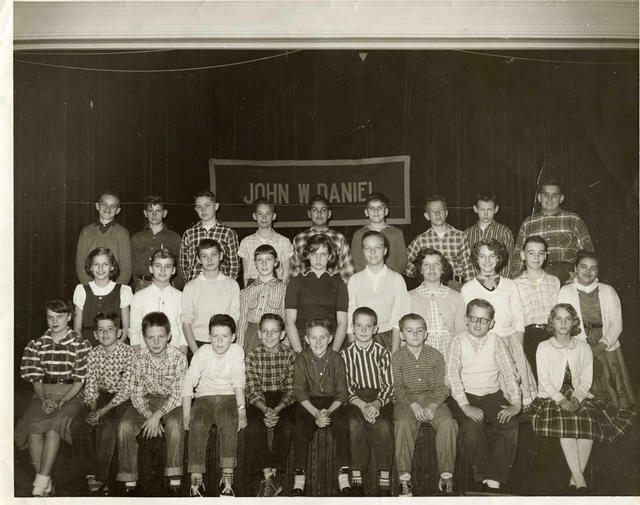 I graduated from HHS - '62 but I did go to John W. Daniel School 1950-53 (1st through 3rd grade). Also I am kin (my sister is his sister-in-law) to Chandler Nelms (HHS - '63 - of MD) - and I enjoy reading his inserts as well. My teacher at John W. Daniel was Ruth Savin who stayed with our class from 1st through 3rd grade. 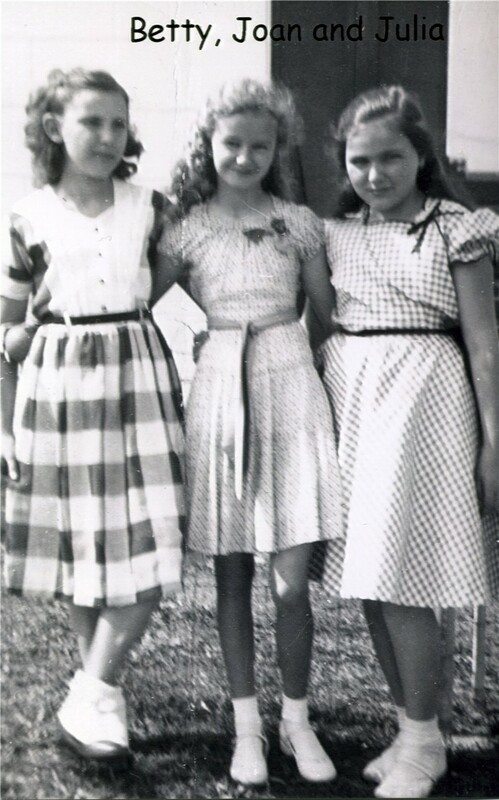 There were four of us girls who became close friends during that time - Betty Smith Carey, Joan, and Julia. I actually ran into Betty at my husband's 45th WHS reunion this September (she is married to Jim Carey, a WHS 60 classmate of my husband). Betty and I had not seen each other since 1953! She mailed me a picture of her and our friends Joan and Julia taken back then. Joan's last name is something like Darnell but not sure, and I can't think of Julia's at all. We would love to re-connect to these old friends but have no idea if they stayed in Newport News. Betty graduated from Warwick HS. I hesitate to give permission to post this in one of your newsletters. 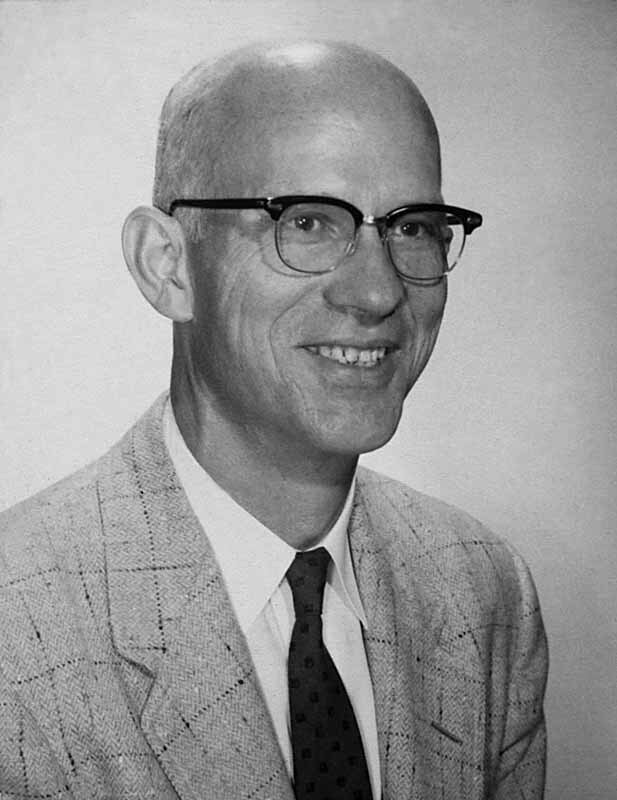 What I was wondering, is there a site where I could find a list of all students that attended John W. Daniel from 1950 to 1953? If I could get the exact names of these two friends, I would like you to post it in your letter to see if anyone remembered them, and could let me know. I am attaching copy of picture. Thank you, June! We wish you well! It was interesting reading the section on "row homes" near John W. Daniel School. I lived on 38th Street, between Washington and Huntington Avenues, from the time I was 5 until I graduated from NNHS in June of 1966. Now it is a parking lot with the NN Shipyard Credit Union at the end of the street. Some of my neighbors were Jerry Seay ('63 - of VA), Danny Childress ('64), Fred Volhein, Pam Russell (Hanzlik - '63 - of NC), Audrey Dixon Kelly ('62 - of VA), Wanda Crump (Harris) ('66), Garland Rigney ('67), Terri McAfee (Artman) ('66), Gilmore Kirby ('64), Glenn Malpass ('65), Jimmy Morrow ('65 - of NE), Kathy Morrow ('67) and many more whose names won't come to mind at 11:38 p.m. In fact, I met my husband while riding my bicycle in September, 1962. No, I didn't run him down, I was on the bike when someone called me over to meet him. He had just come from Garden Creek, VA to attend the Apprentice School. I went home and told my mom I had just met the man I was going to marry. My husband walked over to Johnson's Confectionary and told Mrs. Johnson the same thing! We married in July, 1966. Oh, what fun we had back then! Neighbors were all one big happy family who looked out for one another. I remember skating around the city blocks dodging shipyard workers and store workers with reckless abandon. We walked everywhere because we were downtown so everything was close - stores, movies, restaurants, etc. We played hide and seek in the alleys behind our homes well into the night during the summer months without any of the fears that we have for our children today. Goodness, what fond memories have come rushing back! This marker faces onto 32nd Street. You are looking toward 31st Street. The block is almost entirely pay parking. As I was standing in the middle of 32nd Street setting up the shot, this uniformed lady came down from her parking lot Stalag watchtower and asked if she could help me. I was letting myself imagine what it once looked like 40 years ago, so when she asked if she could help me, I seemed to feel that she was a trespasser, that she somehow didn't belong there. I replied tersely, "No, thank you", and continued to adjust the shot. She said that she thought that I had to get permission to photograph there. I was astonished, but tried to remain a gentleman; I explained the obvious ... that I was standing in the middle of a public street taking a photograph of a public historical marker, looking across a parking lot. She mumbled something about terrorists, and I assured her that neither my camera nor the marker were going to explode. I then invited her to call the police if she felt that strongly about it. She slithered back to her watchtower and said no more. It seems that downtown has devolved into an armed camp, and everyone is under suspicion. Somewhere in the back of my mind is the thought of John Daniels School being a bad school that no one wanted to go to. I remember going to Walter Reed School and thought I was going to be transferred to Daniels but it never happened. But I was told that it was a bad school. Anyone else ever get that same info? "A BAD School?!?" Oh, WOW, I don't remember ever hearing THAT one! I doubt any of its numerous graduates among us would agree with that assessment, either! I imagine we'll be having a mighty onslaught of defenses quite soon now! My school's better than your school. My school's better than YOURS! Thanks, Glenn - this one ought to be fun! When many of the young students attending Walter Reed School were transferred to John W. Daniel School due to the overcrowded conditions at Walter Reed School few of us were excited about the move, as we could easily walk to Walter Reed School from our homes in East End. Being transferred to a "downtown" school meant riding the Citizens Rapid Transit bus to and from school for most of us in my class in the Seventh Grade. Of course, some of us rode our bicycles to school, if we worked after school. We received the same level of education and had friendly and helpful teachers, but access to the many places to eat lunch nearby was a real improvement. 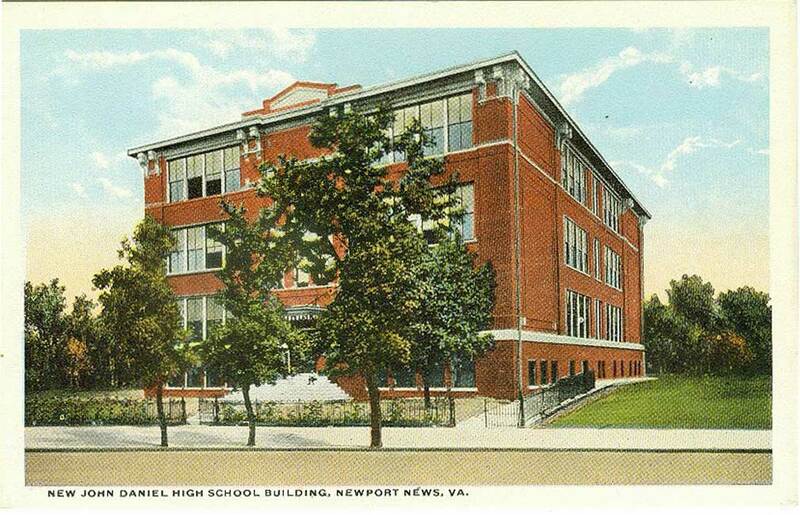 Plus, we got conditioned to the neighborhood where we would later attend Newport News High School in the Eighth Grade. One recollection was the large number of high school students that made their way to the YMCA for lunch and after school. We dared not go to the "Y" at our young age; besides I had a Times-Herald paper route in East End and Western Union Telegrams to deliver in the evenings. My experience at John W. Daniel School was satisfactory. My sister and I remember our elementary school with fond memories. 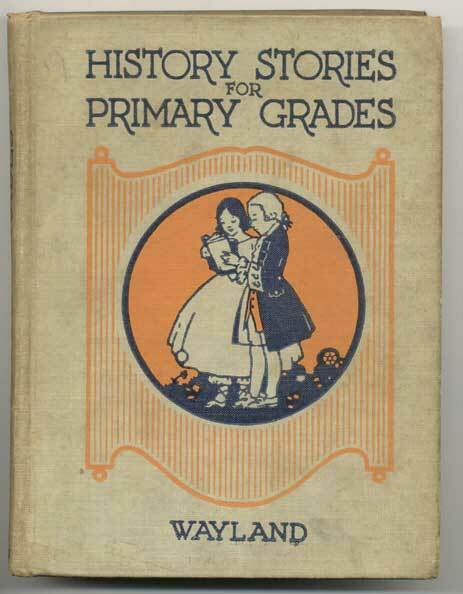 Definitely it was not a bad school; in fact it was a great school. The teachers and pupils that went there were top notch. Our teachers provided us with an excellent education and we had fun while we were learning. Most of the teachers were older and strict but very fair. She went to John W. Daniel from the 1st through the 6th grade, and I went 1st through 3rd. In fact, my sister's 6th grade teacher also taught our father, Nick Veneris. And to bring up another past memory, we also celebrated May 1st with a dance around the May Pole! I miss those simple times..
was my 5th grade teacher; Miss Martin was our good teacher in the 6th grade and Miss Smith in the 7th. to the great Newport News High School. Usually on Thursdays in the spring, Miss Martin read Homer’s Iliad to her sixth graders at John W. Daniel School. The windows were raised and we little tykes hoped a breeze would flow through the room. We didn’t have air conditioning in 1950. Miss Martin favored white tee-shirts all the time and looked exactly like Benjamin Franklin. No kidding. When I look at a $100 bill today, I see her staring right at me. If any of us 30-plus pupils had been caught misbehaving a bit, she didn’t keep us after class, which they could do easily in those days. Instead, she had her own clever punishment — three or four long-division arithmetic problems: dividing long numbers like 899,765,343 by 1487. This was a challenge to a 10-year-old, especially if you had to turn them in the next morning. We were a bunch of sweet attentive boys and girls, seldom if ever drawing the ire of our teacher who never missed a day. We loved the Iliad stories as Miss Martin read to us out loud. Usually once a month, she would give a little quiz, not for grades but to see if we were paying attention about Achilles and the Trojan Horse. If we needed a little help with the answers, she could show a soft side and help us. Miss Martin came to my mind last week during the July 4 homage paid to the great baseball player Lou Gehrig on the 70th anniversary of his famous “luckiest man on the face of the earth” speech. Gehrig was the Yankees’ No. 4, the iron man who played 2,130 consecutive games from June 1, 1925 to April 30, 1939. This record remained for 61 years until Baltimore’s Cal Ripken Jr., broke it September 19, 1998, at 2,632. On that day, July 4, 1939 Gehrig was forced to retire because of what we know today as Lou Gehrig’s Disease. He died at age 38 in 1941. In Miss Martin’s class some 59 years ago, I remember vividly as we pulled out the Iliad for our afternoon session. She began in a pleasant reading manner. Today it seems she reached the Trojan Horse part when I slipped in front of my book, the 1942 orange-covered biography of Lou Gehrig. As she droned on, I forgot about the Iliad. I got lost in the story where little Lou went eel fishing for his mother in the World War I era. He’d bring home his catch, his mother would pickle them and then Lou returned to Second Avenue in East Harlem, New York City, to sell the goodies. I “traveled” that afternoon with Lou as he grew to be a football player at Columbia and then on to became the baseball hero of the Yankees. Suddenly, I heard a voice, “What page are you on?” Miss Martin roared. Naturally I thought she was talking to someone else. I stuttered a bit, tried to sneak Gehrig back in my lap. She kept on, “Can you tell me about the Trojans?” Fear struck at the moment. My classmates laughed. In my book that afternoon it was 1932, not with the Greeks. Gehrig had just hit four home runs in a game against the Philadelphia Athletics. The first player to do so in the 20th century. Miss Martin ordered me to the front of class. She seized my Gehrig book. My penalty was to collect all of the Homer’s Iliad books from the class. WILD GIGGLES! I remember reading that little Lou Gehrig biography myself, Harry, although I was in Mrs. Gladys Curry's 4th grade class at Magruder School when I did so. And Mr. Baines was later our principal there as well! Thanks for the great recollection! 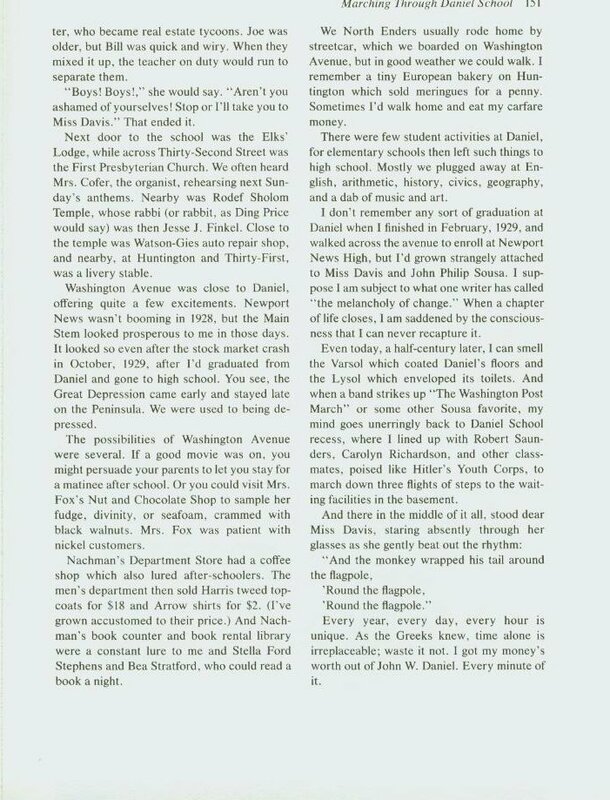 I loved Harry Covert's ('57 - of Northern VA) talk about Daniel School. I especially loved seeing the picture of Mr. Baines. He was a great principal. of a man sewing. Of course I did not think about tailors because no one in my family could afford a tailored suit. His suits were very nicely tailored! He was truly a good influence in our lives. Thank you Harry for jogging our memories on a really good school. a gentleman, but a truly gentle man. In the late 1800s many publications were produces depicting scenes of the United States and the world along with glimpses of art from the famous museums of the world. As traveling was accomplished by means of horseback across country, or by steam ship to travel overseas, only the affluent traveled around this beautiful globe we live on. And even for them it was not as easy as it is today. The majority of the population did not travel and relied upon these publications to see what the rest of America and the world really looked like. They became familiar with the famous paintings in Europe's museums from the pictures they saw in these publications. Photography was developed in the mid 19th century and still in its infancy, Printing processes were developed to reproduce these original photographs for publication for the world to see what people, places and the great art masterpieces really looked like. 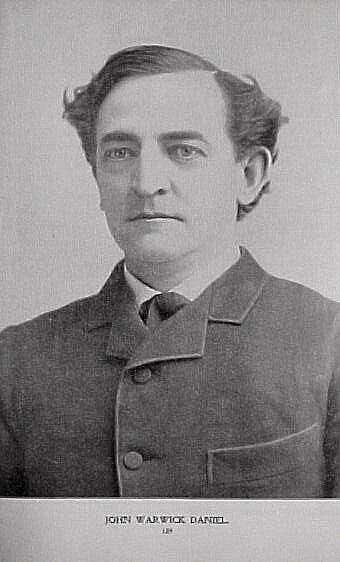 John W. Daniel, a Representative and a Senator from Virginia; born in Lynchburg, Va., September 5, 1842; attended private schools, Lynchburg College, and Dr. Gessner Harrison’s University School; during the Civil War served in the Confederate Army 1861-1864, attained the rank of major; permanently crippled in the Battle of the Wilderness in May 1864; studied law at the University of Virginia at Charlottesville; was admitted to the bar in 1866 and commenced practice at Lynchburg, Va.; member, State house of delegates 1869-1872; member, State senate 1875-1881; unsuccessful candidate for Governor in 1881; elected as a Democrat to the Forty-ninth Congress (March 4, 1885-March 3, 1887); did not seek renomination in 1886, having been elected Senator; elected in 1885 as a Democrat to the United States Senate; reelected in 1891, 1897, 1904, and 1910, and served from March 4, 1887, until his death on June 29, 1910; died before his credentials for the last election could be presented; chairman, Committee on Revision of the Laws of The United States (Fifty-third Congress), Committee on Corporations Organized in the District of Columbia (Fifty-fifth Congress), Committee on Public Health and National Quarantine (Sixtieth Congress), Committee on Private Land Claims (Sixty-first Congress); died in Lynchburg, Va.; interment in Spring Hill Cemetery. American National Biography; DAB; Daniel, Edward M., comp. 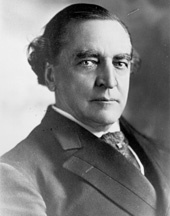 Speeches and Orations of John Warwick Daniel. Lynchburg, VA: J.P. Bell Co., 1911; Doss, Richard. 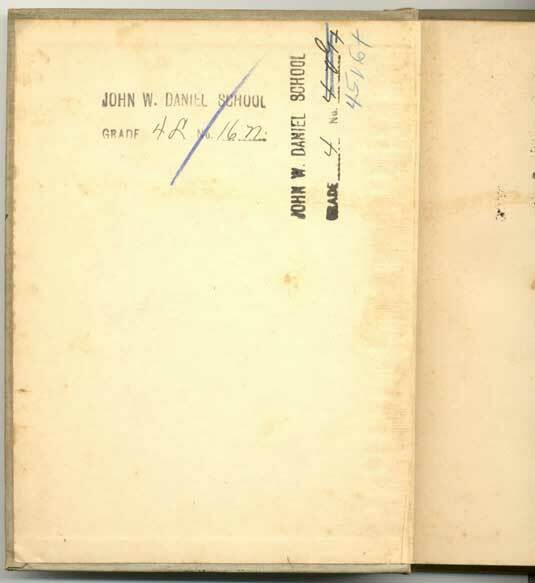 ‘John Warwick Daniel: A Study in the Virginia Democracy.’ Ph.D. dissertation, University of Virginia, 1955.